A limited investigation in south west Ireland identified two alignments for ‘halving the difference’. The two sites are Eightercua (pron. 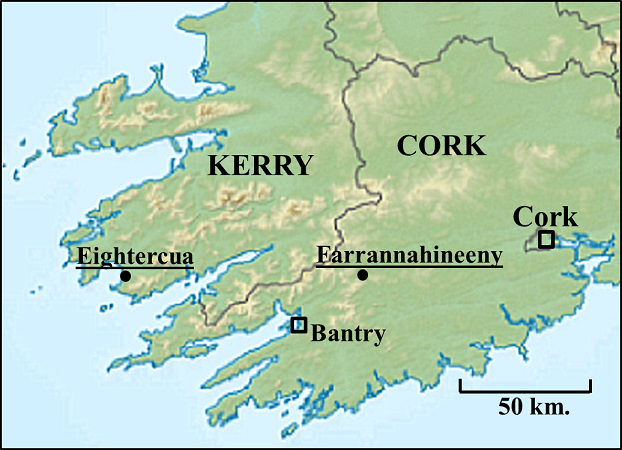 ‘Ite - a - cua’) and Farrannahineeny. 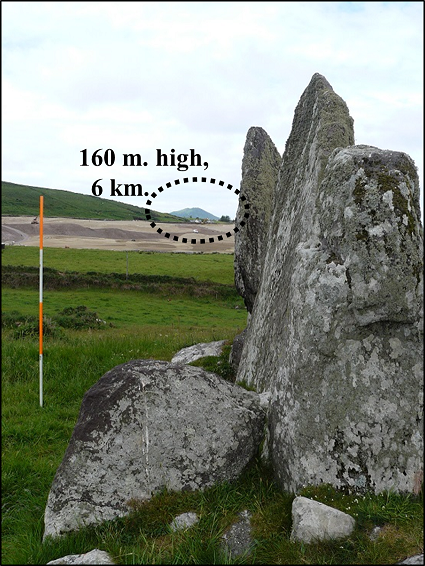 Eightercua is a well known monument in western Kerry about 1.5km. south of Waterville. There are the remains of a possible tomb and an ancient enclosure which suggest that the site had a ritual purpose at one time. It is thought to originate from circa. 1700 BCE. The obvious feature now is a substantial four stone row orientated south west / north east. There are no clear features to the north east. To the south west is a single feature; a 160 m. high conical hill 6 km. distant. About eight days before and after the winter solstice circa 1700 BCE the lower limb of the setting sun would have been seen to pass down the right hand slope of the conical hill.